I hate to tell you this, but I’ve been holding out on you. 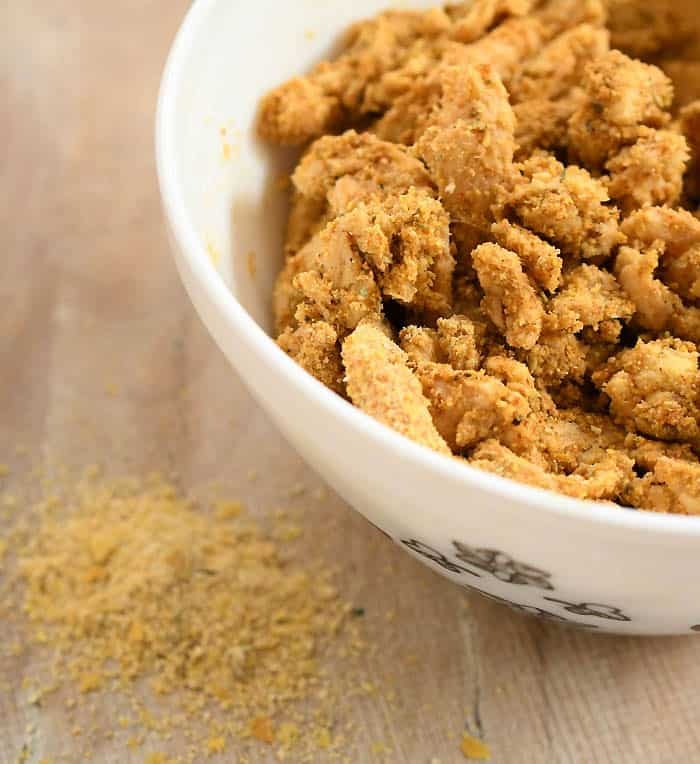 I’ve been making these Vegan Air Fryer Southern Fried “Chicken” Soy Curls for months! It’s taken me awhile to get the time to take photos and actually write down the recipe, but it’s worth the wait. 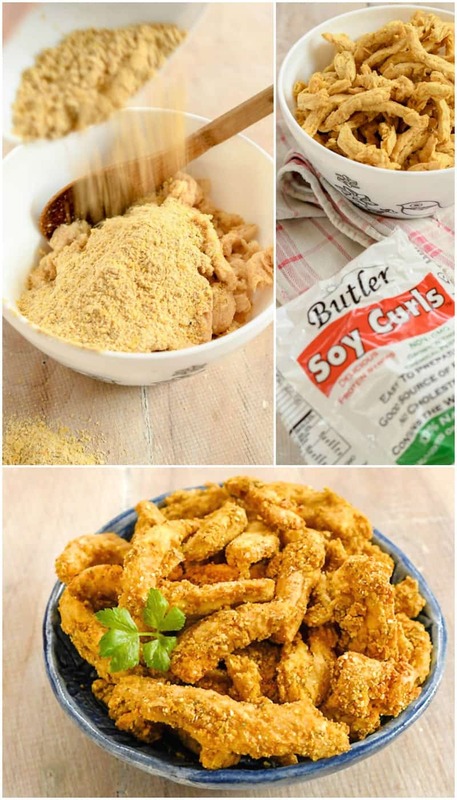 What are soy curls? They just have one ingredient: Whole Non-GMO soybeans. The are sold in stores near the west coast. Since I’m in North Carolina, I order my Butler Soy Curls on Amazon. 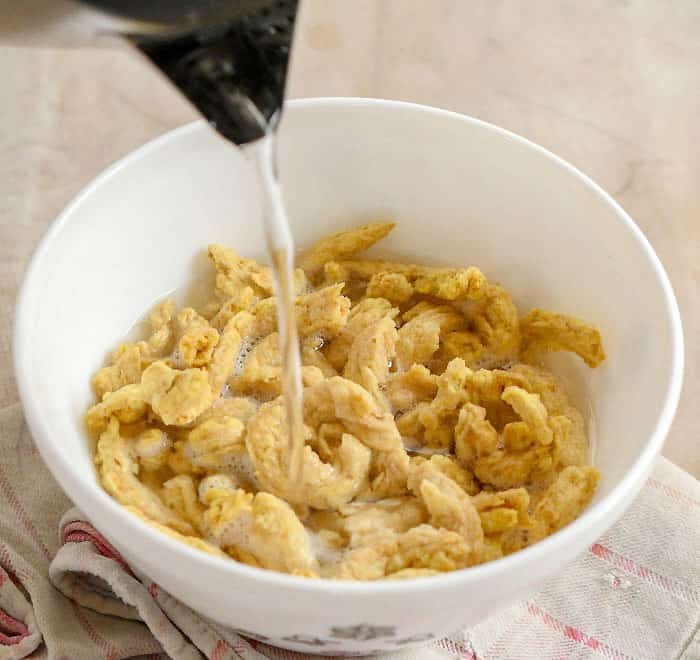 Soy curls look a lot like TVP and come dehydrated. For this recipe, I rehydrate them with boiling water, but when I use them in slow cooker or Instant Pot recipes, I usually put them in dry with extra liquid to save time and effort. In 5 to 10 minutes, they are plump and ready to go. Some people soak them in broth, but in this recipe I add flavor through the delicious coating. Even after you drain the soy curls, there will be enough moisture to hold on the coating. Sometimes some of the coating soaks up some liquid and makes little crunchies separate from the soy curl. These are great on salads. The easiest "cheat" dinner that your family will go nuts over! Put the soy curls in a heat proof pan on the stove and pour the boiling water over them. Let them soak for 5 to 10 minutes, or until soft and plump. Pour into a strainer in your sink to drain, then press the extra water out with a large spoon. 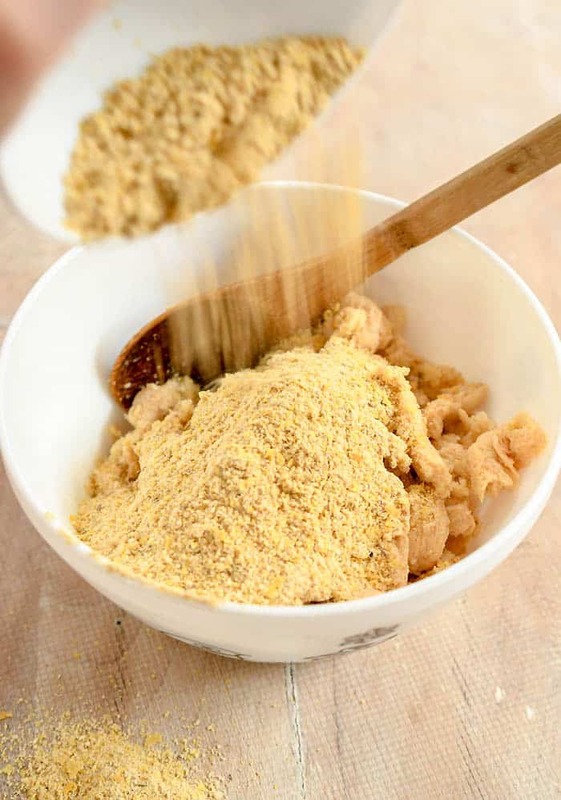 Mix the breading ingredients together well in a small bowl. Add the drained soy culls to a large bowl and mix in breading well. You want to coat each piece. Place the breaded soy curls into your air fryer and cook at 380 degrees for 5 minutes. Shake and cook for 5 more minutes. Serve as is with fries or over mashed potatoes with a golden gravy. Get more air fryer recipes on the blog here, or in my book, Vegan Cooking in Your Air Fryer. I just happen to have half a bag of soy curls in the fridge, so these will be happening later this week! Be sure to let me know how they turn out for you. Hmmm. No air fryer, but the recipe sounds so good. How do you think they would be if baked in the oven at 400 or so for ….. some amount of time? Any tips? I think they will be fine in the oven. I’d check them every 10 minutes or so. These look fabulous! My husband has been hinting that an air fryer would make a good mother’s day gift, so I’m saving this recipe. We LOVE soy curls! I’m in Seattle and haven’t seen them at any local stores, other than our vegan market. I order mine on Amazon too, but hopefully soon they will be more widely available! You may want to check the bulk bins at Whole Foods. That’s where we get our soy curls. ???? Hi neighbor! 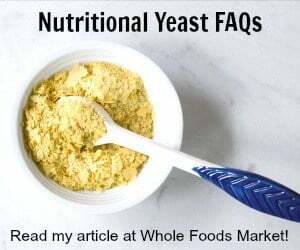 Have you checked Whole Foods and Vegan Haven? I’ve seen the Butler brand bag at Whole Foods and believe I did at Vegan Haven too. I got mine at Marlene’s Market & Deli in Tacoma (also located in Federal Way) for far less than what they cost at Whole Foods. We switched to a vegan lifestyle about 2 years ago now and I have long been curious about this product. Decided to take the dive this weekend and used this recipe to also break in my mom’s brand new air fryer. It was a HIT instantly and glad I grabbed two bags when I did. Ended up making another HUGE batch the very next day. They want me to go get more but I’m afraid they’ll burn out on it too fast so I refuse (hahahahaaa). That’s great! I’m jealous of you guys in the pacific northwest. They are definitely not in North Carolina Whole Foods yet. Kathy, thank you for posting this. I’m on the cusp of purchasing an air fryer, and this recipe is going to be one of the first things I try. These are probably one of the best things I have made since going vegan. And I have made some really awesome recipes. Thank you so much. Hey Kathy, just wanted to thank you so much for sharing this recipe, I ordered the soy curls and just made your Southern Fried Chicken.. Popeyes ain’t got nothing on this great recipe. I decided three weeks ago to go completely plant based Vegan. This recipe was a sight for sore eyes!!!! Thank you for the save!!!!! Did you add any other ingredient to make th3 soy curls taste like Popeyes? Mine came out rather bland. You could add more Cajun spices and cayenne. I think that’s what that chain uses. You could reconstitute in broth too if you want. holy moly! 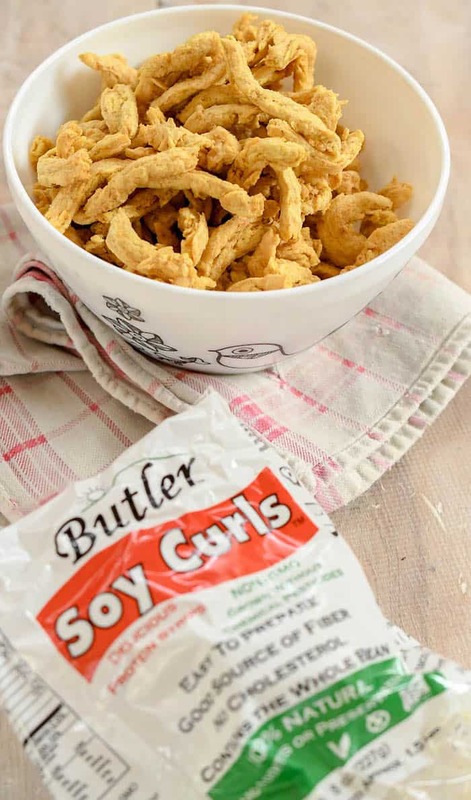 i love soy curls, and these look so good! Just made this, oh my so good, did not want gravy so made a cheese sauce (plant based) poured on them yummy. Tomorrow going to make up some tortilla chips, black beans, my chicken strips and smother with cheese sauce. What poultry seasoning would you recommend. Not sure what to look for. I bought a few bags from Butler’s themselves and they sent extra freebies. Very nice. I do not have it! The only thing I changed was adding, Jada Spices Chicken Salt – it is VEGAN. These are delicious thank you for a different recipe for the family! These tasted good but when I pressed the soy curls with a large spoon to drain the excess water, they broke into small pieces. Any thoughts? Some of them do break, but if all of yours did I wonder if they didn’t get tossed around more during shipping. These are awesome … the grand kids thought they were chicken strips…. 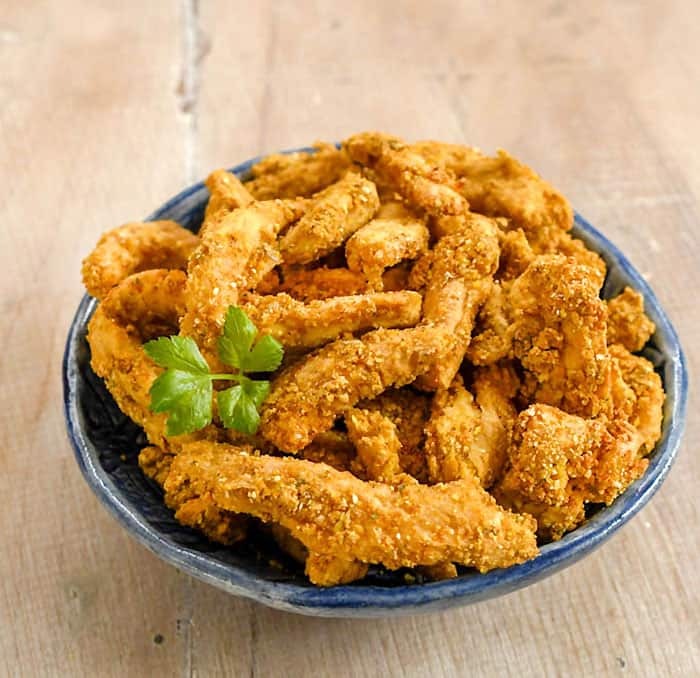 This is an amazing recipe to make in the air fryer with soy curls – have made it several times with different spices – it is a keeper! Wonderful recipe! My doctor wants me to eat a high potassium diet, and I thought soy curls were high in potassium. However, your nutritional list shows only 174 mg of potassium in 1/4 bag of soy curls. Is that correct? One cup of soybeans has 3342 mg of potassium. Aren’t soy curls ONLY whole soy beans? I made a Japanese version of this. Used flour salt, pepper, onion powder, garlic powder and 1/4 tsp of s&b Japanese curry spice. It tasted just like the Japanese karrage chicken wings. Huge hit! That sounds awesome – I need to try it! Just found out about soy curls and made this today. WE LOVED THEM! Thanks for the great recipe!! Excellent! So easy and great flavor. I just made a batch and will make chicken sandwiches. These are seriously good! I gave this recipe 5 stars even though I used brown rice flour instead of cornmeal because I didn’t have any and I left out the cajun. Lol. I’ve made it a few times and put together my plant based version of KFC bowls. “Chicken” soy curls, mashed potatoes, corn, and gravy. Yum!!! My niece said they tasted like chicken. I’m winning her over!